From Amazon: High school senior Karen, who worries that her psychic powers will make her seem different from other people, is frightened at first when a young policeman asks her to use her gift to help the police locate missing children. I read this when it was published in the UK as The Eyes of Karen Conner - I actually prefer that title - it sounds more interesting and I think it sums the book up better. I re-read this book so many times when I was younger I think I could probably have quoted it word for word! 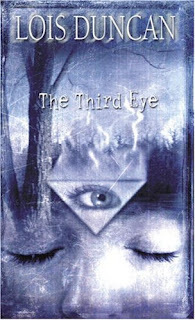 I loved the romance, the mystery, the coming of age, Karen's psychic ability - everything about it! It is well written, although possibly short by today's standards, has really good characters and a great plot - and how much did I love the ending! Lois Duncan has written many books - the film 'I Know What You Did Last Summer' was based on her novel of the same name (her book is much better by the way!) Those that stand out for me alongside The Third Eye are Don't Look Behind You and Stranger With My Face. Grrr - for one second I thought this was a Lois Duncan book I hadn't read, then I realised I read it as The Eyes of Karen Connors too. But yay!! It's a wonderful book. I loved Lois Duncan books when I was a teenager - I read every single one! (And yes, when I read this it was called The Eyes of Karen Conner. I also agree that I Know What You Did Last Summer was a great book. Some of her other books were made into films, weren't they? I can't remember which ones now - I'd have to look it up! But, yes, I was definitely a huge fan!